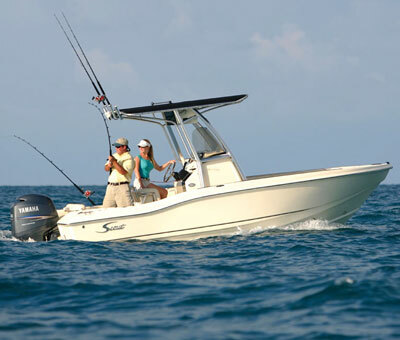 The Scout Boats homepage features details on the 205 Sportfish. According to Scout Boats the new 205 SF combines comfort, style and performance into one center console beauty. Stainless steel hardware and cup holders, ample rod and tackle storage, a 90-quart removable cooler complete with cushions for forward seating while underway and an aerated bait well with high speed pickup are just a few of the numerous standard features. Four stainless steel vertical rod holders, two stainless steel flush-mount rod holders, rod storage under the gunwale for up to three more rods and rod holders behind the helm leaning post offer plenty of storage . Other Standard features include a 148-quart insulated fish box/storage area with overboard drain, a 63-gallon fuel tank, raw water wash down, Bay Star hydraulic steering and a removable wave gate with stern seat.